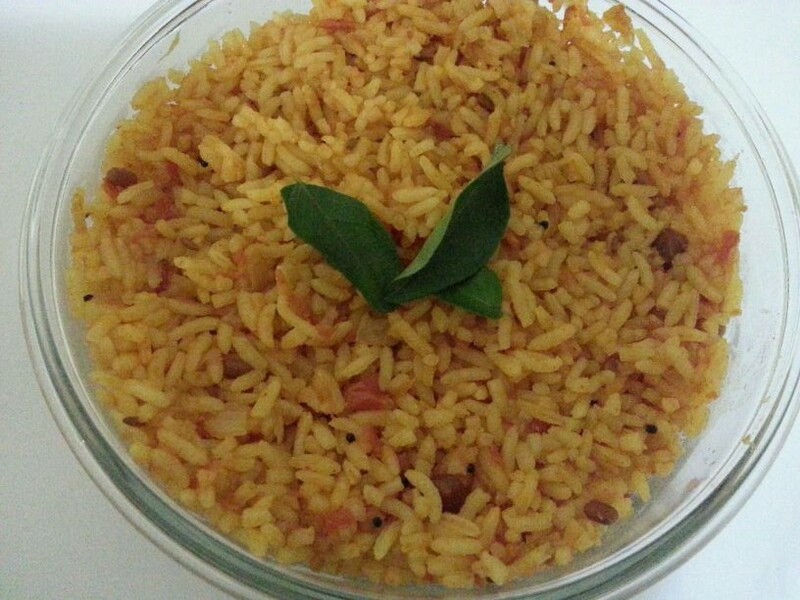 I now love tomato rice. I never ate it till I got married. My mother used to ask me to taste at least but I would simply refuse. 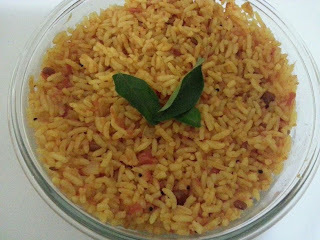 We were discussing food when I mentioned tomato rice to my husband and he asked me to prepare it. I made it only for him but tasted a spoon when he said there was less salt and instantly fell in love with the taste. I have been preparing it regularly since then and yes for both of us. 1. Cook rice using any method till it is 3/4 cooked. Keep it aside. I cook rice by adding it to boiling hot water with salt and 2 teaspoons of oil and draining the starch water once rice is cooked. 2. In a cooking vessel heat oil. Add dried red chillies, mustard seeds, urad daal, chana daal, cumin seeds and curry leaves in the same order and temper. 3. Add the chopped onions and fry till translucent. 6. Add turmeric powder and mix. 7. Reduce the flame to low. 8. Add chilli powder, coriander powder and salt and mix well. 9. Add the tamarind extract and mix. 10. Let it cook on low flame till tomatoes are cooked and oil starts separating. 11. Add the cooked rice and combine to coat the rice completely with the tomato mixture. 13. Cover and cook on low flame for 2-3 minutes mixing twice in between to avoid burning.